Hi folks! So glad you’re joining me to see my second St. Patrick’s Day pallet sign. If you had a chance to see yesterday’s We’re a Wee Bit Irish sign you would have seen just how I put these guys together. It is so easy, not to mention cheap! Both of these stunning pieces of St. Paddy’s decor cost me only $1 for the pack of carpet tacks (thanks to my sista with a steed, the horseshoes were FREE). Who doesn’t want to feel a little extra luck? 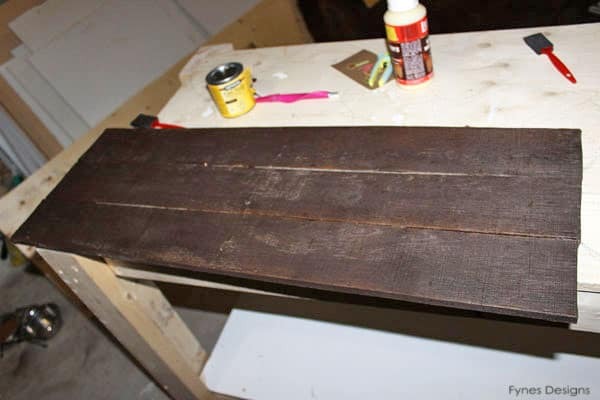 The only difference in the preparation of the two signs is that this one I gave a coat of stain before stencilling. Also, I was running low on vinyl so I just used cardstock to create the mask. It surprisingly worked just fine, I just taped the edges down with painters tape. I used a dabbling motion rather than brushing with my foam brush. When the paint was dry I gave the entire sign a good go over with a sanding block, it made it look a bit more worn. 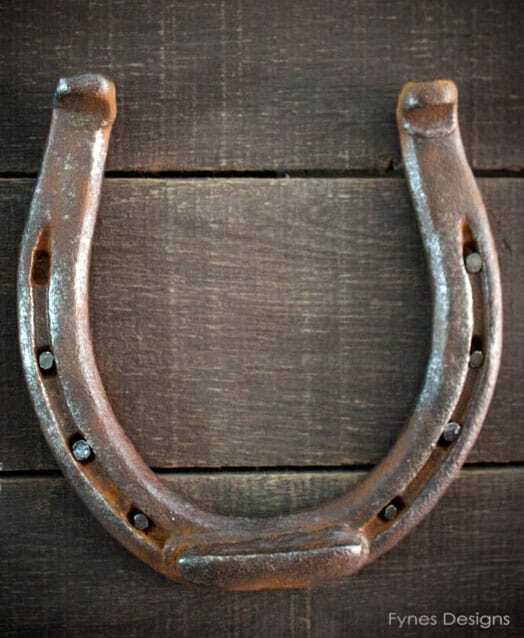 I then nailed on my horseshoe with carpet tacks and Viola a sign to bring you luck! 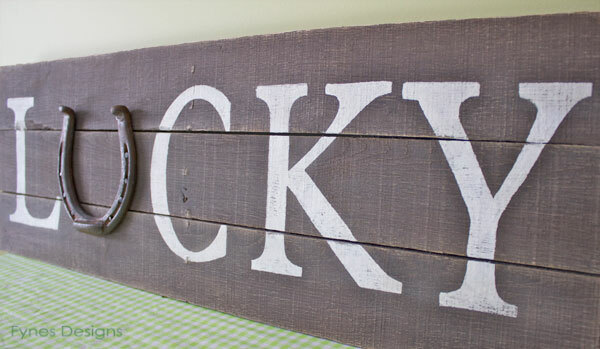 You most certainly need to create one of these signs, every home needs a little extra luck! If you give it a try please be sure to link up on the Fynes Designs Facebook page. I love to see your creations, plus I have a fun survey going on, I’d love to know your opinion. My typing isn’t exactly top shelf, I understand gibberish! Thanks for your kindness! This is such a beautiful sign! We featured it tonight and are so grateful that you submitted it! Have a wonderful night! Thanks so much! I really enjoyed making it, I think it is the beginning of a sign making addiction! I really love this sign and I’m jealous because I wish I was handy enough to make something like this. Unfortunately I’m clueless when it comes to using wood for projects. Maybe I’ll put it on my goal list for this year. Thanks for sharing! I can’t lie, I have a handy ‘behind the scenes’ elf on my staff if I run into a snafoo! Where do you get your “letters” from ?? I have my lucky horseshoe (yes really) and this is the perfect way to display it. Thats great that you really have one! You certainly need a way to display it! Hi… Love love love this. When we were dating my husband and I found a horseshoe. We call it our lucky horseshoe. It’s been sitting in our garage for years. What a perfect way to display. I so happy I found this blog. I have 1 question. Do you know what size font and overall board measurements? I’m definitely making this one!! This sounds like the perfect sign for you! The overall sign is approx 30″ long by 18″ wide. The letters are about 8″ tall. I hope that helps, I’d love to see your project when your done! Thanks for stoping by! 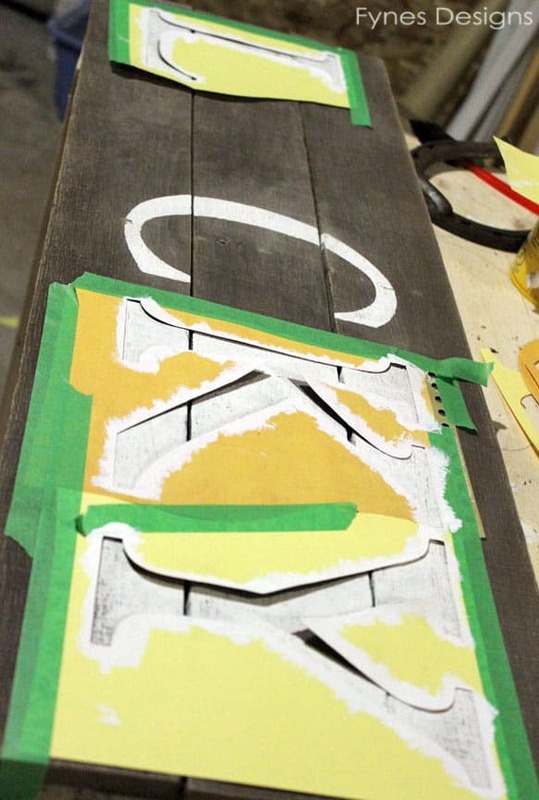 How do you keep your stencil from bleeding? I didn’t have much trouble with the pallet wood and bleeding. However, if you use a pouncing motion rather than brush stokes on the edges you’ll be better off. Good “luck”! Hi, I absolutely love this and would love to make one similar. Can you tell me approximately what the dimensions are? Ours turned out great! I’d be happy to share a picture, but there isn’t an option for posting pictures? Swing by my Facebook page, I’d love to see! Swing by my Facebook page, I’d love to see your creation! I would like to use your Nailed Horsehoe on the old board image as the cover on my e-book. I wrote a story about a blacksmith in the old west. How can I use your image for my story? You’re welcome to take the image from the blog and use it. However I can’t send you a High res because my computer crashed and its gone now.